Prototype is our series of beers to give us a chance to stretch out and explore. New ingredients, new techniques, new flavor combinations are all fair game. For the 7th iteration of this series, we wanted to explore Denali, a hop that comes across to us as a fascinating combination of pineapple and dankness. We have really enjoyed this hop on smaller scale batches, and wanted to see how it would pair with more citrus forward hops. 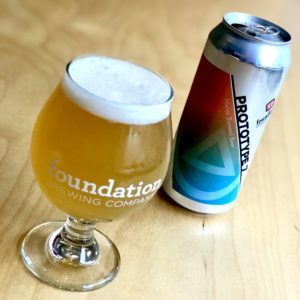 El Dorado and Citra seemed like a natural fit, and Prototype 7 was launched. We also wanted to explore the use of flaked barley in the grist. Traditionally used as component of dry stouts to add body and smoothness, flaked barley can come across as a bit more neutral than the oats or wheat we more commonly use in our IPAs. Pale yellow in color, the barley comes across first in the creamy head. The dankness of Denali explodes across the nose, with undercurrents of citrus and tropical fruit. Across the palate we taste notes of orange pith and white grape. Prototype 7 finishes smooth and easy, belying the 7.1% abv. We really enjoyed the final results, and hope you do too!